Easycooking: Churmundo ~ A sweet start for the New Year!! As always,a sweet start for the new year and the new decade.Churmundo literally means Churma laddoo,ie laddoo made with atta/wheat flour.I’ve always been a lover of its cousin Besan laddoo and thought both were the same when I had it first.Boy,I was wrong.Churmundo is a totally different kind of laddoo,one which literally melts in your mouth.Or rather,powders in your mouth. In a thick bottomed kadai,add 5 tbsp ghee and let it liquefy. Add the atta and mix well-the mixture will start bubbling,keep stirring. Roast the atta for 20-25 minutes on low flame stirring continuously. Switch off the flame and add the powdered sugar. 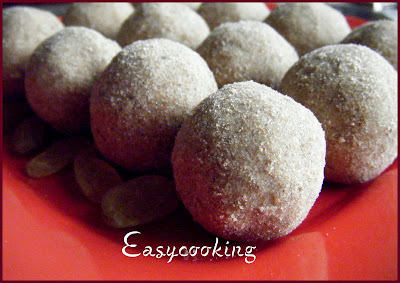 Melt the remaining 1 tbsp ghee and add it to the mix and make laddoos while the mix is still warm. Hi Divya, How are you? Wish you a very happy new year and Congrats on ur win. What a great way to kick start the new year. These are my personal favorites and I make them for my kids as these are very healthy. Beautiful sweet treat to start a year...looks prefect..
looks so yummy ...happy new year.. Happy New Year..This looks FAB! Hi Divya and Ajai... We wish you a very happy new year.... You seems to be a cooking genious.... Latest Ladoos was mouth watering....!! Yummy....Again and Again I'm telling to you.....POOR AJAI....SO SAD OF YOU...!! delicious treat for the new year. looks yum!! Congrats! The laddus looks very tempting indeed ! Happy New Year....were u in Kerela? The laddoo looks fabulous ! Congrats on the win and A very happy new year to you ! Have a wonderful 2010 ! 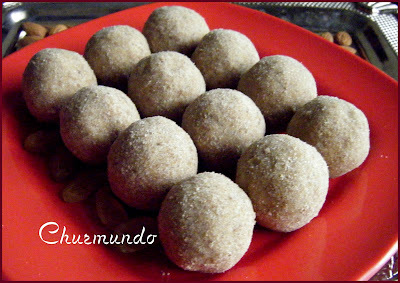 Yummy ladoo..they have turned out so perfect dear and congrats on winning the second prize. hi divya..long time!! !AAAAAAAAaaah..gouva undo..my all time fav...they simply melt in our mouth dont they......urs look perfect!!! Victoria cake? I really dont know what the differance is...this book was on sale at crosswords and there is no specific authot to this book but it has some 50 recipes which look easy to do!this is the second time i have had a cake without a burnt botton.pls try it divya...its worth the taste. Wow..thanks for sharing a wonderful recipe like this..Congrats on your prize too !! Have a great year ahead !! this is new to me, i have tasted rava ladoo only; i am going to try this. Dear: Collect your well deserved AWARD! Hey how have u been..been awhile since u posted something...hope all ok. Thank you so much for your lovely comments and New Year wishes. Good recipe for Churmundo and very well steps for Khotto making. Since Jackfruit and Haldi paan (for Patholi) leaves are rare here in US, I was wondering what other leaves can be subtituted. During Ganesh chavathi, I miss Patholi and Khotto.